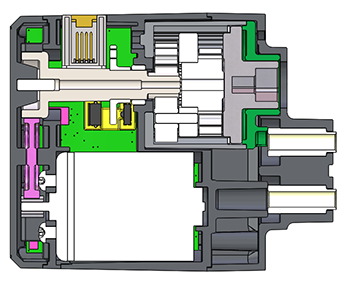 The V5 Smart Motor is the product of thousands of hours of engineering and analysis aimed at perfecting the gears, encoders, modular gear cartridges, as well as the circuit board, thermal management, packaging, and mounting. This thoughtful design allows users to control the motor's direction, speed, acceleration, position, and torque that turn the robot's wheels, arms, claws, or any movable component. 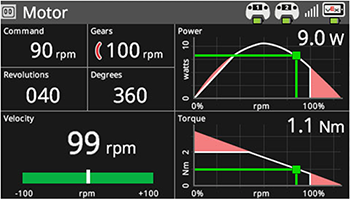 The V5 Smart Motor provides feedback data about its position, velocity, current, voltage, power, torque, efficiency, and temperature. The V5 Smart Motor's internal circuit board is impressive with a full H-Bridge and its own Cortex M0 microcontroller to measure position, speed, direction, voltage, current, and temperature. The microcontroller runs its own PID (proportional–integral–derivative) with control over the velocity, position, torque, feedforward gain, and motion planning similar to industrial robots. The PID is internally calculated at a 10-millisecond rate and the PID values are pre-tuned by VEX for consistent performance across all operating conditions. Users can adjust the motor's PID values to tune a motor's performance for more advanced mechanical systems. Advanced users can bypass the internal PID and take direct control with raw, unaltered PWM (pulse-width modulation) control. PWM, like PID control, still has the same limits that keep the motor's performance consistent. The V5 Smart Motor is completely consistent in its performance. The motor runs internally at a slightly lower voltage than the V5 Robot Battery's minimum voltage, and the motor's power is accurately controlled to +/-1%. This means the motor will perform the same every time, regardless of the battery's charge or the motor's temperature. The motor's internal temperature is monitored to make sure the motor lasts. If the motor approaches an unsafe temperature, there is a warning. If the motor reaches its temperature limit, performance is automatically reduced to ensure no damage occurs. The motor calculates accurate output power, efficiency, and torque. It also reports its position and angle with an accuracy of 0.02 degrees. Those calculations and other data are reported and graphed on the V5 Robot Brain's motor dashboard, as shown above. Aside from the control and consistency that the V5 Smart Motor supplies, the motor has easy-to-replace internal gear cartridges for output gear ratios of 36:1 (100 rpm) for high torque & low speed, 18:1 (200 rpm) for standard gear ratio for drive train applications, and 6:1 (600 rpm) for low torque & high speed which is best used for intake rollers, flywheels, or other fast moving mechanisms. This makes the V5 Smart Motors faster than the previous 393 Motors. Whereas the 393 Motor maintained only 2.7 watts of continuous power and peaked at 3.93 watts, the consistent 11-watt power levels during both peak and continuous performance enhance the stability of the V5 Smart Motor. While the battery is low, the V5 Smart Motor continues to put out 100% power, unlike the 393 Motor which reduced to only 51% power under low battery conditions. This greatly improves the V5 Smart Motor's consistency, especially in combination with other previously explained enhancements. As previously explained, the V5 Smart Motor provides feedback data related to position, velocity, current, torque, temperature, etc. This is a great improvement over the 393 Motor that only provided feedback related to its position. 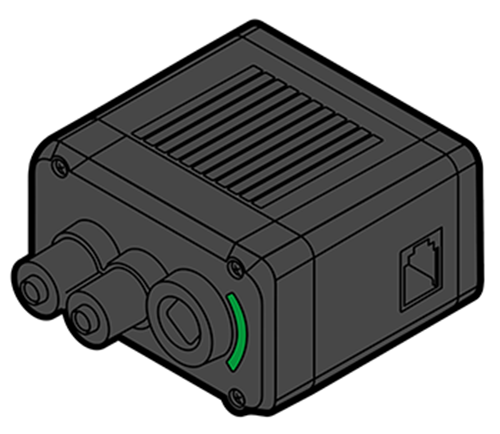 The V5 Smart Motor's feedback system provides a user with the information needed to then iterate on their robot and program. These are valuable learning opportunities for new robotics students who can then account for these factors within their designs, and for more experienced robotics students who can visually see the relationships and dynamics within the motor's functioning.